This quartet enjoyed an amazing success in Schubert’s lifetime. Indeed, it may be said that with the exception of Erlkönig, if the number of public performances were any indication of its success, it was the most popular of all Schubert’s works. And why not? It has a very pretty tune, and it requires the first tenor to indulge in tastefully elegant leaps, jumps, roulades and excursions above the stave which are not only impressive in themselves but which approximate to a non-ornithologist’s idea of the song of the nightingale. Above all, the piece has enormous charm and, if performed correctly, delicacy. It is no surprise, however, that the same public which clamoured for more performances of this work, was addicted to Barbaja’s diet of bel canto opera at the Kärntnertor. The key is D major, undoubtedly the composer’s favourite tonality for music of this kind; the choice is somewhat practical and has a great deal to do with the comfortable singing range of the tenors and basses. The first verse is gently powered by Schubert’s favoured dactylic rhythm in the three lower voices—the metre of the poetry make this an obvious solution—while the lead tenor fills up the bar with mellifluous quavers which seem to hop from branch to branch within, and later beyond, the fenced-in aviary of the stave. Despite this, there is a folksong-like steadiness and poise to this music which goes well with the background idea of ‘Treue’ (constancy). Having had a happy first strophe, the second (with an effective switch to F sharp minor) concentrates on the more soulful aspects of nightingale song. At ‘Sanft gleitet die Stimme’, a figure of a dotted quaver is followed by two demisemiquavers, a figuration descriptive of a tiny shudder or frisson. We find this, also in conjunction with dactylic rhythm, in the middle section of the celebrated Der Wanderer (at ‘Die Sonne dünkt mich hier so kalt’). The connection, as far as Schubert’s motivic language is concerned, is that the estranged wanderer trudges, and the nightingale’s voice glides—these are both instances of highly-charged emotion in the context of onward-going movement. Schubertian dactyls always imply ineluctable movement, in nature, of some sort or another, whether of stars in the firmament (Die Sterne) or the gliding progress of death (Der Tod und das Mädchen). In Die Nachtigall they depict another natural phenomenon which has been with us since time immemorial—birdsong. This minore middle section modulates into A major the better to return to the home key of D major for the third verse. This is simply a deliciously ornamented recapitulation of the song’s opening; indeed it might be called a variation on the first verse, so capriciously inventive are the changes between the two versions. This time, the phrase ‘im wirbelnden Ton’ is set as a type of measured trill, hocketing high in the stave on F sharp and G. Underneath this warbling the piano reaches an F sharp major chord—the dominant of B minor. And then it is straight into a rollicking final verse (in D major once again, now marked ‘Allegro’) which has the character of many a Schubertian drinking song. The measured 2/4 of the nightingale’s music is replaced by a earthy 6/8. Tenor I begins and, after twelve bars, Tenor II joins as if in a round, using the words of this strophe all over again from the beginning. He sings the same twelve bars and the first voice provides a high descant based on an inversion of the theme. It is then the turn of the lower voices: Bass II begins—the tune now in G major, and after two bars Bass I takes up the theme, in closer canon this time and with an inverted version of the theme. This is yet another repetition of the same words, but above them the tenors are singing ‘So verhallte manch’ himmlisches Lied’ in augmentation. It is all very ingenious and we do not really need to notice how clever it is. Tenor I, the erstwhile nightingale, has been relatively unadventurous for this section, but he is liberated in the final few pages and returns to his high-flying decorative antics. There is an expressive chromatic descent for the words ‘in’s fühlende Herz’ (these words are repeated) with which the piece closes. The piano part is almost always a straightforward reduction of the vocal parts; so much so that Deutsch was moved to doubt whether this accompaniment, as with those of other pieces like it, was genuine Schubert. (The guitar part printed in the old Gesamtausgabe is almost certainly spurious.) It is true that the piano writing does not show a great amount of imagination and independent invention—and this suggests it was conceived for rehearsal purposes. On the other hand there are a number of tiny but important details in the accompaniment—spacing of chords, interludes between the vocal passages and so on—which make it hard to imagine this song entirely without piano. This is particularly true of the music for the beginning of the third verse where the first tenor would sound inappropriately stranded without the piano’s hearty support. It might be, however, that the piano part was insisted on by the publisher, and provided by another hand. Johann Unger was a sometime lawyer, teacher, writer and singer. He was responsible for introducing Schubert to the Esterhazy family, when the Count was seeking a live-in music teacher for his two daughters during the summers. Schubert thus had Unger to thank for the paid employment of the summer months spent at Zseliz in Hungary in 1818 and 1824. Unger was the father of the celebrated mezzo soprano (and occasional song composer) Karoline Unger (1803-1877) who later composed songs under her married name of Sabatier. Karoline was a pupil of Vogl and the first mezzo soprano to sing in Beethoven’s Ninth Symphony. Schubert was appointed to a temporary post as repetiteur by the Kärntnertor Theatre, and he was responsible for coaching Karoline in the role of Dorabella in Così fan tutte. 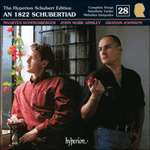 Schubert set two texts by Unger, Die Geselligkeit in 1818 for male quartet, and in 1821 Die Nachtigall, which was an immediate hit. Neither of these appears in the volume of lyrics by Unger which had been published in 1797. His aspirations as a poet are well documented, but it is a little-known fact that Unger was a rather talented amateur composer and took pleasure in setting his own poems. Indeed, he set both of the above texts as solo songs. A slim volume of his Lieder (possibly the only one), scrupulously handwritten in sepia ink and beautifully bound, has come into my possession. 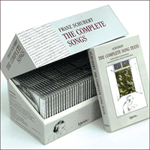 This volume was almost certainly Schubert’s source for the two poems he set. Pictured below is a page from Unger’s manuscript of his own setting of Die Nachtigall. Note the sudden eruption of a piano cadenza which depicts the warbling of the bird in startlingly visual fashion. Unlike Schubert, Unger did not dare to ask for such virtuosity from his singers. In hallenden Schlägen, im wirbelnden Ton! Auf Schwingen der Töne in’s fühlende Herz. in echoing strains, in eddying tones. in the sweet harmony of souls. and blissful sorrow into our tender hearts.